This recipe is available in a printable recipe card at the bottom of this post. 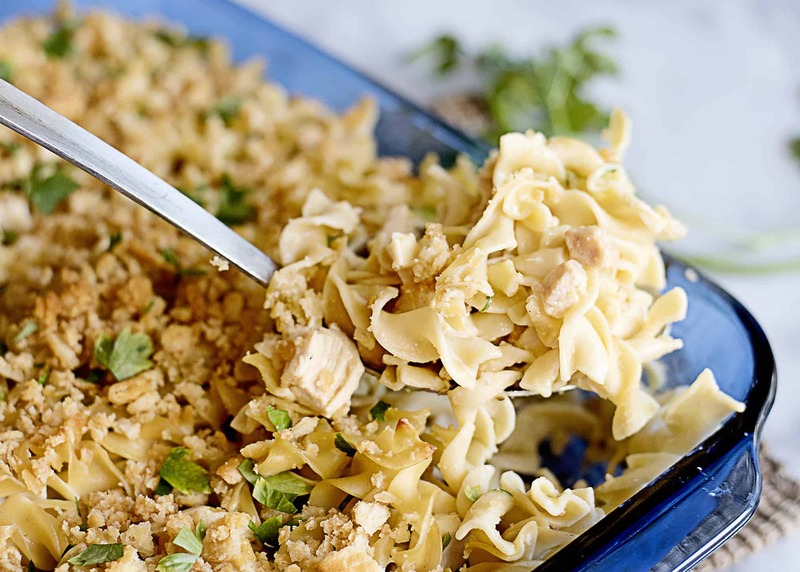 This Chicken Noodle Casserole is a kid favorite wherever it’s served, and my husband seems to get just as excited! The ingredients are simple so it’s a great last minute supper for busy evenings. 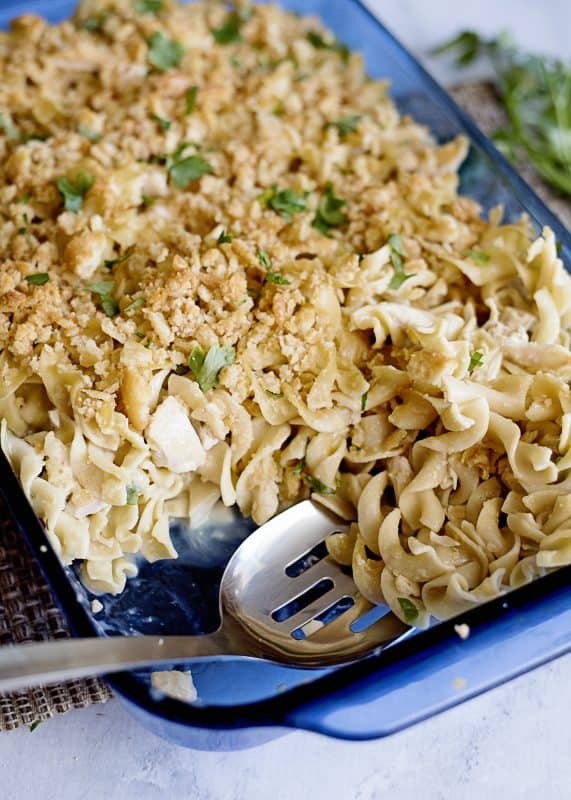 With a few shortcuts, you can have this all on hand as a shelf stable meal, too! I’ll put those instructions below and a link to my other shelf stable Bags to Dishes meals as well. Warning: this is ridiculously delicious. This cassorole has no right to be this simple and taste this good. We used to have a houseful of picky eaters and it wasn’t just the kids! My husband was super picky, having only a small array of foods that he would eat. Now I know a lot of folks are thinking to themselves that being picky is a sign of being spoiled or not valuing the ability to have food, etc. I understand this mindset and in some cases these are valid concerns. However, having that attitude does nothing to solve the problem and serves only to antagonize and alienate those folks who are currently in the trenches trying to help move family members move beyond this. Therefore, for the sake of this post, I’m just going to ignore that valid (but useless) point. If we’re not part of the solution, we’re part of the problem. What I’d like to focus on, instead, is how to help move people from being picky eaters into enjoying a wide variety of foods. There will always be foods people dislike on a different level. This isn’t about preferences, it’s about aversions. First and foremost, we need to understand that we each have food items that we have serious, more deep rooted issue with. This goes beyond food preferences into the category of food aversions. When someone has tried a food several times and you find they literally shudder at the thought of eating it, it’s time to let that one go. Examples of this are me and avocados, my husband and fried eggs with a runny yolk, etc. We have tried these foods repeatedly and have a serious aversion to them. This is not the same as being picky. Sometimes there are moral issues. If you are ever cooking for someone who has moral reasons for avoiding certain foods, the correct and proper thing to do is avoid serving those foods to them, period. If they are a guest in your home, that is simple hospitality. Deciding to “sneak” some of these foods into their meal is entirely unacceptable. This is not about pickiness and it is not our place to determine whether or not moral issues of others are valid. Instead, it is our place to respect those boundaries as we would surely want others to do were the situation reversed. 1. Be careful of expectations. Sometimes our own expectations of picky eaters inadvertently take away their ability to explore new foods. When we make something and say “Oh but you won’t eat this, it has ____ in it” or we avoid placing something new on their plate, we are sending the signal that this behavior is expected of them. Instead, I like to remove expectations and treat every meal, especially ones with new foods, as if it is going to be enjoyed by all. When a picky eater doesn’t try something new on their plate, I ignore it and place it there again next time, with full expectations each time that they will eventually try it. It is amazing how often this has worked! One of the most important things we can do to help picky eaters it to teach them nutrition. Explain how a body works and runs and the role that a variety of foods plays in that. Point out how certain foods give us more energy, certain foods make us feel tired, etc. Kids are never too young to start teaching them about how to fuel their bodies and you’ll be surprised at how much this logic will go on to fuel their future food choices! 3. Let them play a role. From the time my kids were little, I have always loved taking them grocery shopping. I would challenge them to go into the produce section and pick out a new fruit or veggie they wanted to try. This got them personally invested in that veggie and rooting for everyone to love it because they had been the ones to pick it out. Note: This strategy works for people of all ages! My daughter is fourteen and really interested in nutrition right now. She’s overhauled the entire household with her way of eating by setting an example. She has learned about nutrition and discovered that she feels her best when she has lots of fresh foods and lean protein. She’s quit sugar almost entirely (except for the rare treat) and drinks only water as her beverage of choice. When she first started eating this way it was hard for me to find foods she liked and would eat. This wasn’t being picky, it was her trying to eat in a way that made her feel her best. So, I started taking her to the grocery store with me. I had taught her long ago how to read nutrition labels and as I shopped she would go up and down the aisled looking for new things that she wanted to try. Through doing this, over time, our pantry has been absolutely transformed. We have all tried and discovered new favorites when it comes to meals, snacks, and even treats. We gave Katy an opportunity to help shape and form our meals and she has ended up transforming them for the better. 4. Everything doesn’t have to be your favorite. This is something that is important to realize and to impress on kids even though I first took notice of this in my husband. As I mentioned earlier, he had a very limited selection of things he would eat. I started out catering to that a little bit but quickly grew tired of such limited meals. I am a big veggie person and for years my husband only recognized potatoes as a valid veggie for eating. One day, I sat down and said “You know, everything you eat doesn’t have to be your favorite. You’re over 40 now, your body would like it if you ate a green bean now and then.” He thought about it and, being a very reasonable person, agreed to try some the next day. With that one revelation, he began trying a wide array of veggies and now pretty much eats whatever I cook. Of course, there are a few veggies he really doesn’t like but he did try them several times before determining that. If you know your picky eater hates avocados, don’t try to get them to try something with avocados prominently featured and lie about it. Look for new foods that you sincerely think they will enjoy. The goal is for their trust in you to prove fruitful and beneficial to them. And again, if you know there is a moral issue, show them that you take that seriously and make a noticable effort to accommodate that. Each of these behaviors helps to build trust and makes people more likely to try out your food suggestions in the future. 6. Take advantage of new environments in which there is no expected behavior. One of the best times to get picky eaters to try new foods is while traveling or on vacation. In new environments, patterns of behavior haven’t been set and people are far more willing to try new things. Once, when we were on vacation, Katy was hungry and the only thing readily available were chicken egg rolls. Katy had never been willing to try cabbage or egg rolls at home but this was a new place, she was hungry, and they were available so I bought us each one. To this day, she still loves egg rolls and that one instance of trying new foods successfully led her to try a lot of new foods on that trip. I’ve used each of these strategies in my home and we now have a house full of folks who eat a wide variety of foods. Meal planning is pretty simple as a result and our diets have a good variety of different “fuel” sources. I want to encourage you to be patient! Some young children are often put off by different textures and strong flavors but they will outgrow that over time. My Katy once went an entire year when she was two eating mostly orange foods! Carrots, cantaloupe, cheese, and orange yogurt kept her going during this crazy toddler time. This way of eating seemed to begin overnight and end just as quickly as she moved on to eating pretty much whatever was placed in front of her, only to get a little picky again years later. She’s now one of the healthiest eaters I know. What are some of your helpful tips for picky eaters? I’d love to hear your helpful tips in the comments and stories of what has worked for you. Of course, humor is ALWAYS welcome as well so hit us up with your crazy tales of picky eaters. 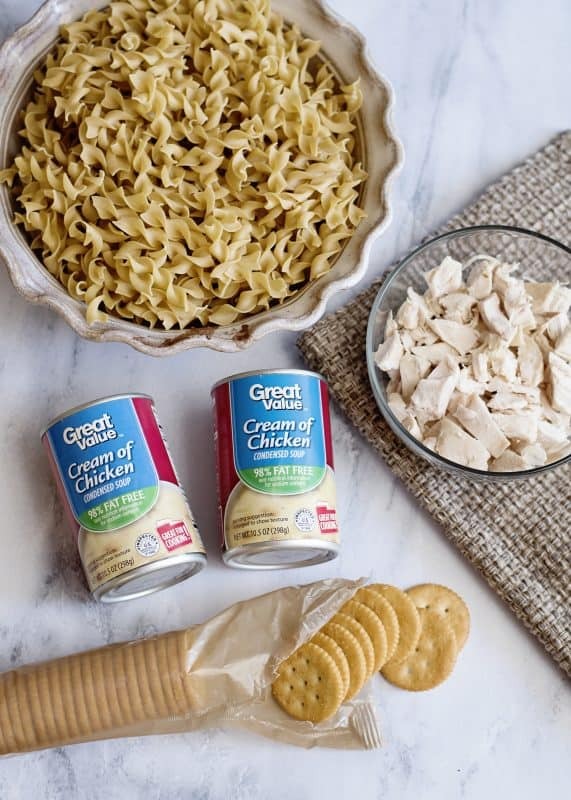 You’ll need: Egg Noodles, Cooked chicken*, Milk (not pictured), Cream of Chicken Soup, and an optional topping of round crackers and a little butter. This picture shows fat free but I usually use regular Cream of Chicken. You can use your favorite or you can make cream soup from scratch using this recipe. You can also make your pasta from scratch and even raise and process your own chicken if you like – but I’ve found few purists willing to go much further than the homemade cream soup :). 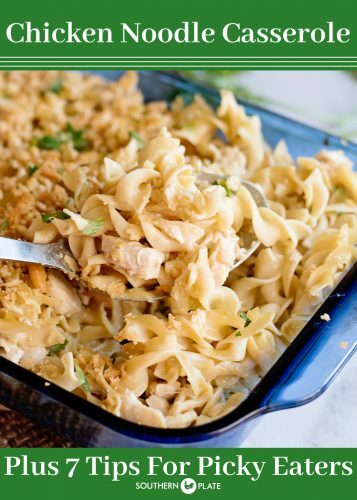 *I sometimes pick up a rotisserie for a quick lunch and save the rest of it for this casserole. You can also just use a large can of cooked white meat chicken in water, drained. Cook egg noodles until just done, being careful not to overcook. Drain well. Place soup, chicken, milk, and cooked pasta in a bowl. Stir that all up really good. 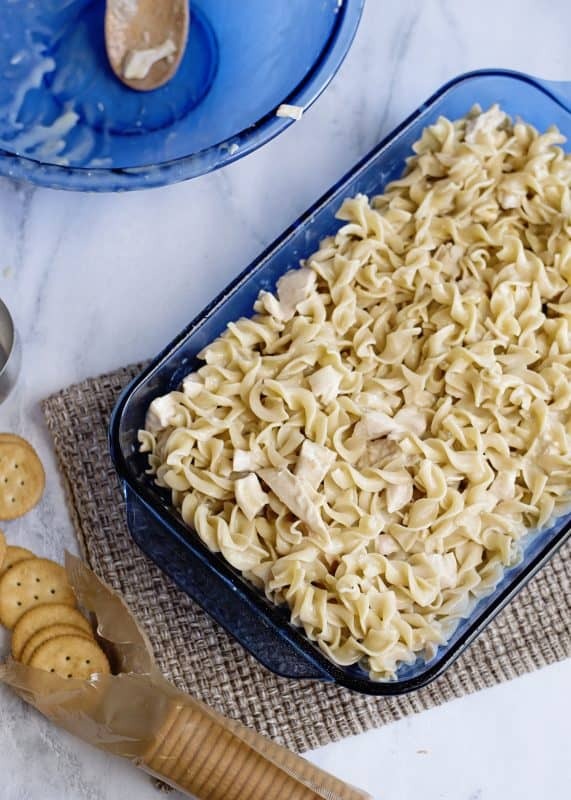 Spoon into a 9×13 casserole dish that has been sprayed with a little cooking spray. 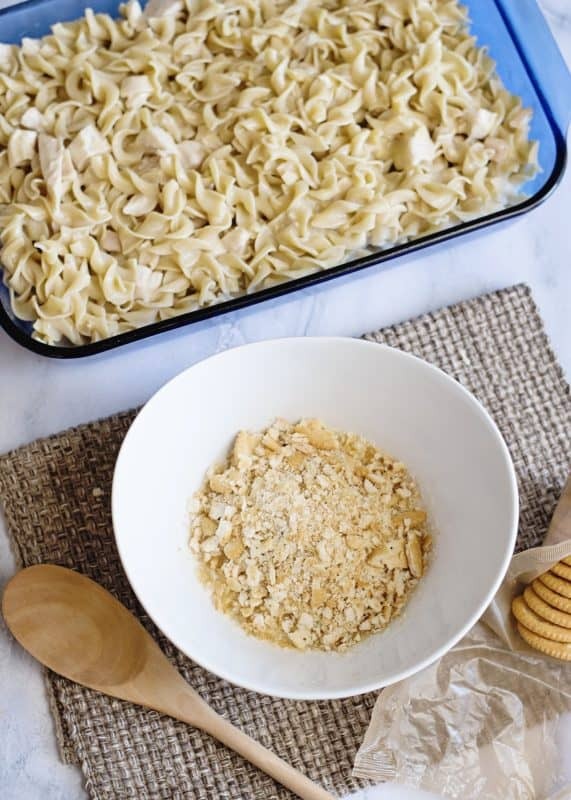 If you want to add a little topping to make it prettier, stir together 1/2 a sleeve of crushed crackers and 1/2 a stick (1/4 cup) of melted butter. Sprinkle this over the top. Bake at 350 for about 20 minutes. I like to serve this with a low carb veggie such as roasted asparagus or green beans. Cook egg noodles according to package directions until just done, careful not to overcook (I like to undercook them by a minute or two). Drain. In large bowl place hot egg noodles, cream soup, milk, and chicken, Stir until combined. Pour into greased 9x13 pan. Optional topping: Crush 1/2 sleeve Ritz crackers and stir these crumbs together with 1/4 cup melted butter. Sprinkle over top of casserole in baking dish. Bake, uncovered, 20 minutes at 350. Serve hot. 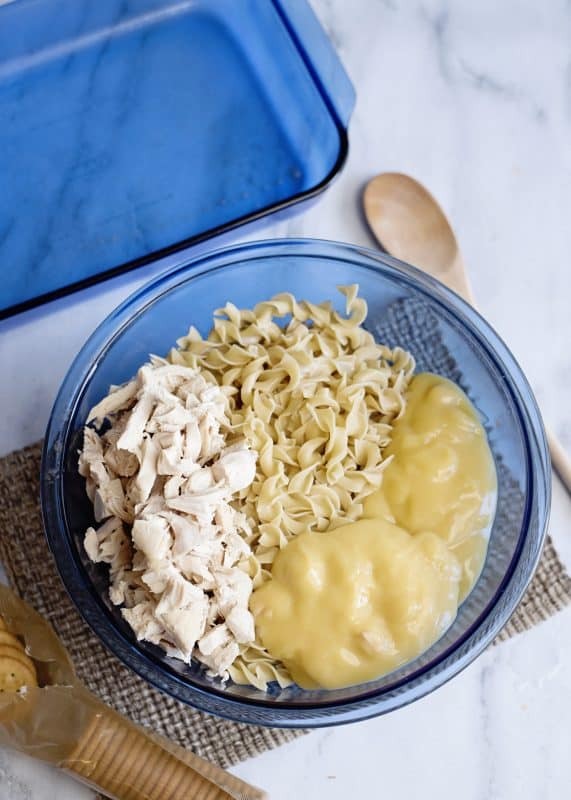 Place 2 cans of cream of chicken soup, a 12.5 ounce can of chicken, a 4 ounce can of evaporated milk, and a package of egg noodles into a large zipper seal bag along with a printed copy of this recipe. Click here to read about my Bags To Dishes meals. Bloom where you’re planted, even if you don’t get to pick the field. ~Shared with me by my friend, Karen Terry. I make this often and add a packet of Ranch dressing mix for extra flavor. So tasty! And sometimes instead of a cracker crumb topping I will use fried onions instead :). As for picky eater stories, the first one that comes to mind was my aunt who insisted that she did NOT like chicken. At all. No way. Well, she was at a bridal shower for another family member and kept going on and on about how delicious the tuna salad sandwiches were. No one had TOLD her it was tuna salad, she just assumed it was. She ate a couple of them and then someone told her it was actually chicken salad, not tuna, and she refused to eat another bite! LOL! The ranch idea is wonderful, thank you!! and HAHA!!! That is a funny story!!! lol I’ve known a lot of people who would have done the same thing! This is pretty much how I make Tuna Casserole, use mushroom soup, velvetta cheese and potato chips on top. Ooh that sounds yummy – I don’t even like Tuna but I’d like to try this one! 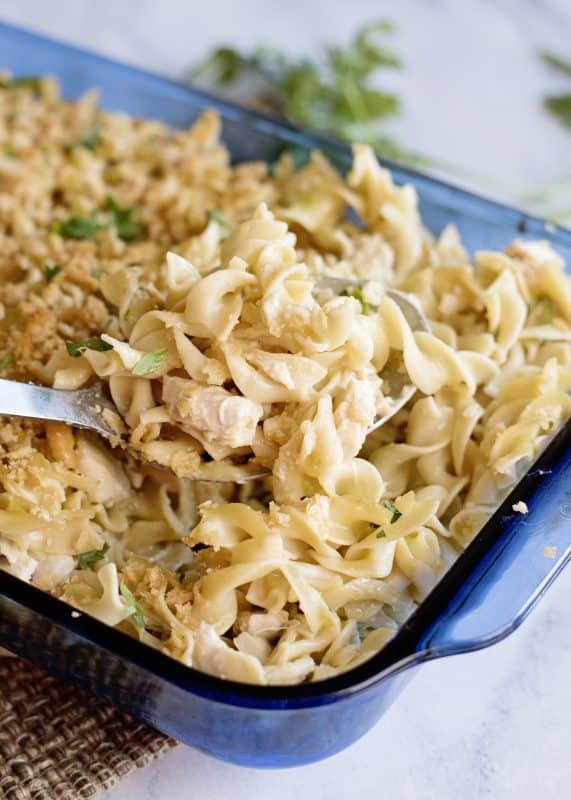 Christy, my husband didn’t like tuna either, so I made that exact casserole with canned chicken. We all loved it! Wonderful idea Shannon, gets some of those green vegetables in!! Do you think this would freeze well? 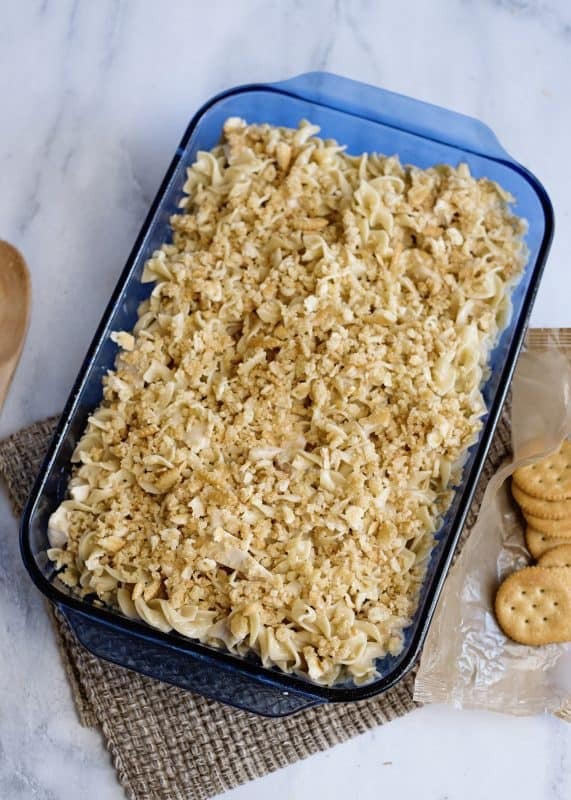 I would wait to put the ritz cracker topping on it until after it has thawed or cooked (from frozen) for a while but I wonder if the noodles would be okay if frozen. Hey Leah! I haven’t tried it but I think it would work. If you give it a try let me know how it turns out, and if I get a chance to freeze it I will let you know. I tried freezing and had no problems with the noodles. Thank you for letting us know Wendy!! I loved vegetable up until I was 3 (or so my parents told me) when my little brother was introduced to “people food” and he didn’t like them. So I stopped liking them. My mother would always put a spoonful of vegetables on our dinner plates and I would treat them like pills, swallowing them down with milk, unchewed (even green beans). My husband has taught me to like some vegetables – always fresh (no more cans) and cooked way differently from the way my mom cooked them. My oldest granddaughter only liked chicken when she was beginning to eat “people food”, so every meat was called chicken no matter what it really was. She outgrew that and now will eat almost everything. Thank you for another winning recipe!! I am trying not to giggle at the thought of a child swallowing veggies whole like medicine! That was innovative! lol I LOVE that you called all meat chicken, sounds like something I would do! Susan, I just appreciate the mess out of you! Thank you for being here and always bringing joy! I makethis adding a little sour cream . Sometimes I cut the soup down and use a jar of Alfredo and mix parm cheese in the cracker mix on top . It’s all good . For color you can add a can of drained green peas !!!! I use whatever pasta I have on hand. I’ve used wide egg noodles, fettucine, macaroni, penne etc. The only difference seems to be that the penne soaks up more of the sauce so it can be a little dry. I am sure there is some way that you could. I don’t use an InstaPot though so I can’t really help you with the instructions on how to do so. Someone or something “deactivated” my internet & I just have it back on. Hope I can still get your recipes! Made this tonight exactly per your instructions….. just halved. Turned out BRILLIANT! Husband had two helpings. This is going to be one of our RV-friendly staples….. thank you again for a new family favorite!